Turn left or right. AERATE non-stop. All without raising the tines out of the ground.The CLASSEN "Split Drive" technology permits the CLASSEN Turf Aerator to offer two unique features not available with other coring machines. 1) By using the two user-friendly steering controls on the main handle, the operator can steer, turn, and aerate around trees, corners, and plantings WITHOUT RAISING THE TINES OUT OF THE GROUND. Also, the same control system is used to ensure STRAIGHT LINE aerating operation on side hills and difficult terrain. 2) Because the tines themselves propel the machine, penetration during aeration is "mechanically positive" instead of "weight related", permitting deeper and easier aeration in all soil conditions. 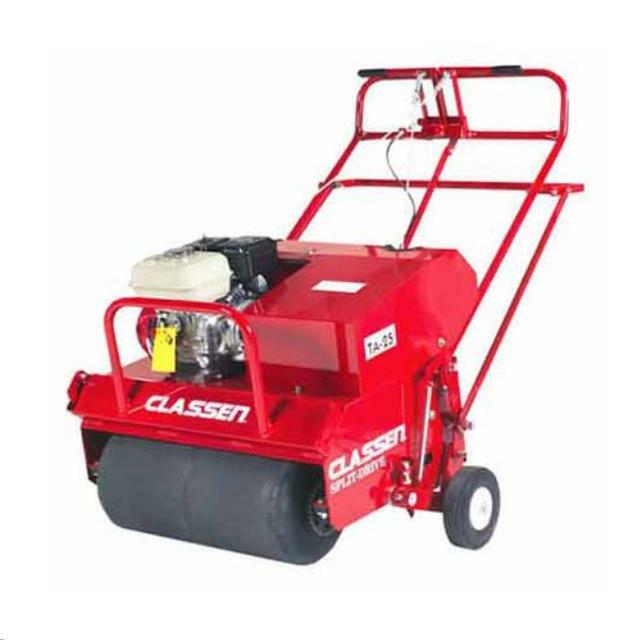 * Please call us for any questions on our aerator gas drum 25 inch wide rentals in Tualatin and Eugene, serving the Portland Metro area, Eugene/Springfield Metro area, Oregon, and SW Washington.